The Gonzaga women’s basketball team kept waiting for someone to step up at crunch time Monday. It never happened, so now the Bulldogs will be waiting until next Monday to find out if they’ll be playing in the NCAA tournament. “I’m not 100 percent confident,” coach Lisa Fortier admitted after the top-seeded Bulldogs blew a 10-point halftime lead in a 61-55 loss to fifth-seeded BYU in the semifinals of the West Coast Conference tournament. No seed as low as No. 5 had ever defeated a No. 1 seed in the tournament. The Bulldogs are 24-7, but they’ve lost three of the past five games, and the WCC is lightly regarded in women’s basketball. The NCAA tournament field will be announced next Monday. “Selection Monday is going to be a sweaty day,” GU athletic director Mike Roth said with a smile. If the Bulldogs don’t make a sixth straight trip to the NCAA tournament, they’re a lock to play in the Women’s National Invitation Tournament (WNIT) and open at home. Gonzaga ranks among the national attendance leaders with a 5,399 average, and the WNIT loves a good crowd. The Cougars ramped up their defense in the second half, when they outshot Gonzaga 50-25 percent from the field. “To be able to play defense like that in the second half is a coach’s dream,” BYU coach Jeff Judkins said. In the first half, Gonzaga shot 40 percent and held BYU to 26.9 percent. BYU junior guard Lexi Eaton, the WCC’s leading scorer, went 8-for-8 at the free-throw line in the final nine minutes. She finished with 16 points despite 2-for-9 shooting from the field. Eaton had a game-high four steals and played sterling defense against Elle Tinkle, who went 0-for-4 from the floor and scored two points. Tinkle ranks third on the Bulldogs in scoring with an 11.8 average. The Cougars had lost three in a row to Gonzaga, dating back to last year’s title game. Gonzaga won five of the previous six tournaments held in Las Vegas, including the past two. BYU beat the Bulldogs in the 2012 title game. Gonzaga forward Sunny Greinacher on the second half: “We might have lost a little bit of composure.” Greinacher led the Bulldogs with 15 points, five offensive rebounds and 12 total rebounds, but she also had a game-high six turnovers, and she scored only two points after halftime. Judkins played five seasons in the NBA. Thurl Bailey, the uncle of BYU star Morgan Bailey, played 11 years in the NBA. 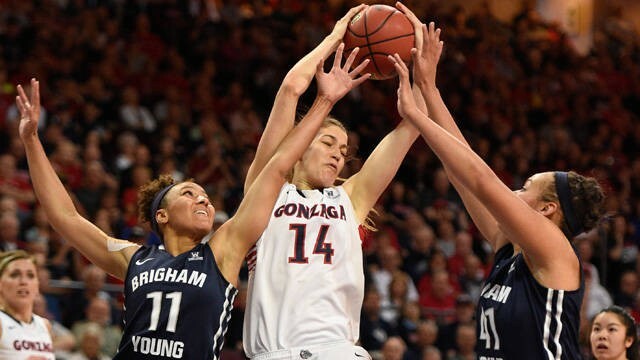 Gonzaga center Emma Wolfram received a bloody nose fighting for a rebound, so she stuffed a tissue into the offending nostril – but only part way. Most of the tissue was hanging far below Wolfram’s nose, so an official ordered her to the sideline to stop the bleeding. The Bulldogs mascot – he’s human, ya know – removed the “dog head” part of his costume after the game when hidden from fans, and the young man looked genuinely distraught about the loss. He wasn’t the only one, since the vast majority of the estimated 5,000 fans were Gonzaga supporters.